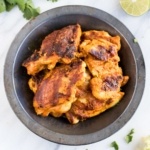 Tender and juicy low FODMAP tandoori chicken is an easy low FODMAP chicken recipe filled with all kinds of Indian-inspired flavors! It’s also gluten-free and dairy-free. 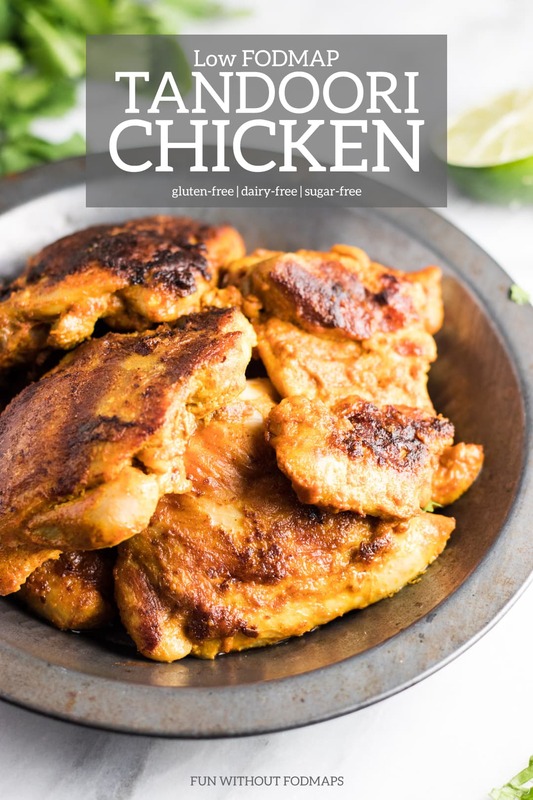 Friends, this may be my new favorite low FODMAP chicken recipe. It’s super tender and oh-so-flavorful! 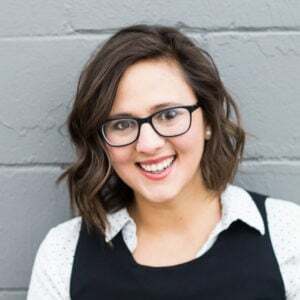 And, it’s part of my Around the World Wednesday series where I am aiming to bring you a FODMAP-friendly recipe inspired by a dish somewhere around the world every Wednesday. 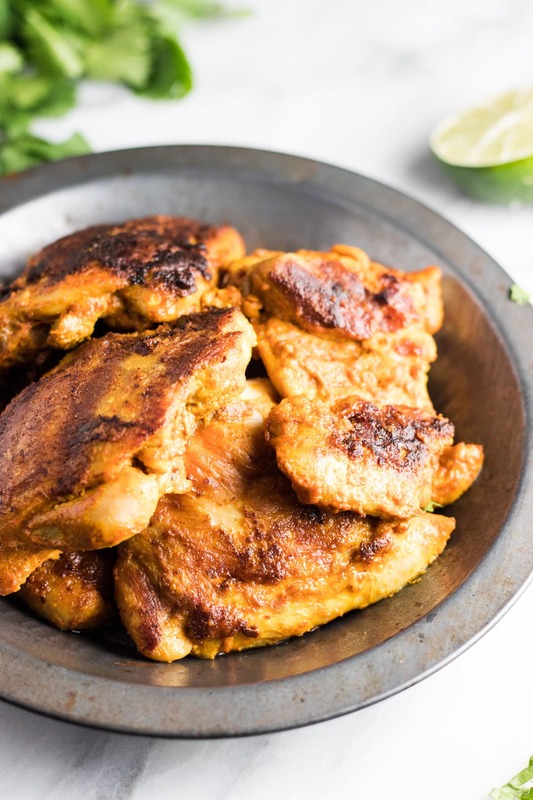 If you’re not familiar, tandoori chicken is a popular Indian dish filled with all kinds of flavor from spices like coriander, cumin, ginger, and more. At many Indian restaurants at least here in the US, you’ll easily spot the tandoori chicken, as it’s typically bright red-orange in color (from added food coloring). This recipe is really easy to make. You just mix the marinade ingredients (a lot of which you might already have on hand), add chicken, marinate, and then grill. To make it even more simple you can even mix everything in a gallon-sized Ziploc bag, seal it, place it in the fridge until you’re ready to cook. Easy peasy! Recipes for tandoori chicken usually call for yogurt as a base marinade ingredient. So, to make it a little bit more FODMAP-friendly (and dairy-free for folks like me), I’ve swapped out the yogurt for canned coconut milk instead. The coconut milk adds a nice creaminess to the marinade and also helps keep the chicken really tender. Serving this chicken with lime wedges also helps add some tang which the yogurt also typically adds. It’s delish! Now, as I mentioned before, tandoori chicken is commonly served as a bright red-orange dish. You’re welcome to add food coloring to the marinade if you’d like to achieve that color, but for my low FODMAP chicken tandoori, I’ve opted for the more natural yellow-orange hue from antioxidant-packed turmeric. Typically tandoori chicken is served with rice and an Indian flatbread called naan. As many types of rice are low FODMAP, rice would be a great side dish to have with this low FODMAP tandoori chicken. Naan, however, is usually made with wheat flour and yogurt. 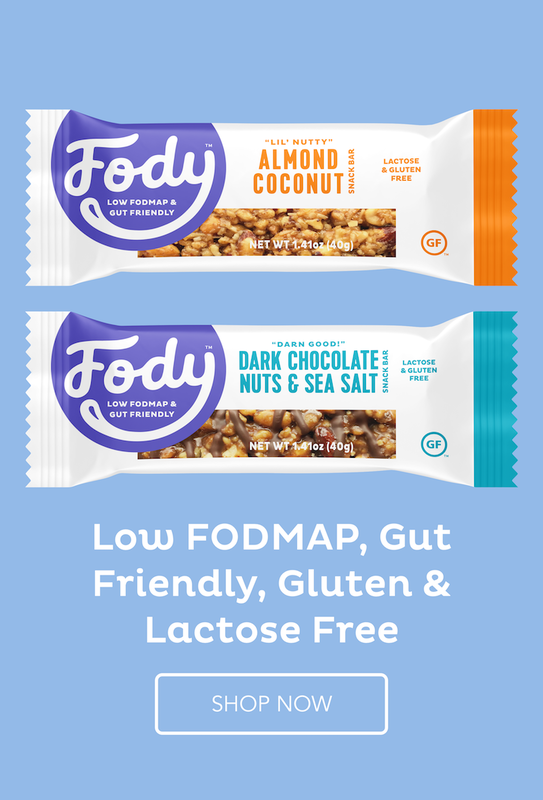 So unless you can find a FODMAP-friendly option (and if you do, please let me know! ), it’s best to avoid naan while low FODMAP-ing. I would also recommend serving this with a side of FODMAP-friendly veggies to help create a more balanced meal. My personal favorites are broccoli (low FODMAP in ¾ cup servings), carrots, and red bell pepper. 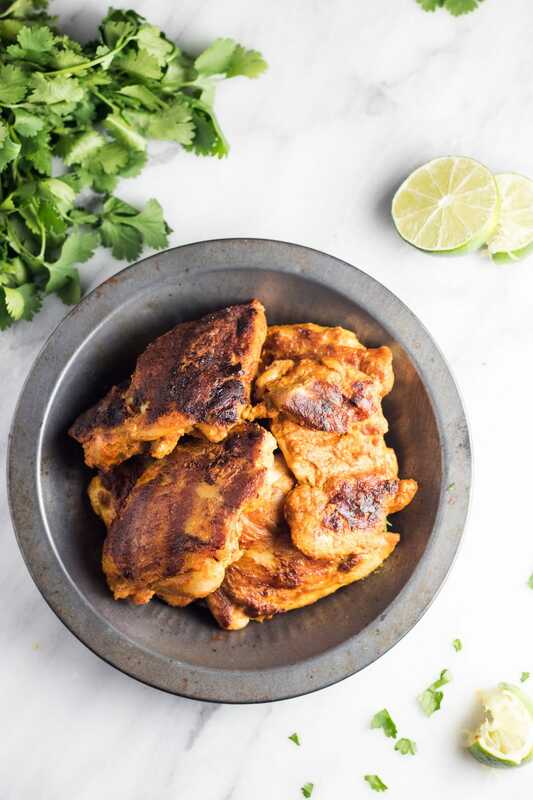 This tender and juicy low FODMAP tandoori chicken is an easy low FODMAP chicken recipe filled with all kinds of Indian-inspired flavors! It’s also gluten-free and dairy-free. Whisk together coconut milk, olive oil, paprika, salt, coriander, cumin, ginger, turmeric, and optional cayenne pepper. Add chicken and stir to mix. Cover and place in refrigerator. Ideally, marinate for 8 hours. When ready to cook, preheat grill or broiler. Remove chicken, discarding any remaining marinade. Grill chicken until cooked. Serve warm with lime wedges. Canned coconut milk: A low FODMAP serving of canned coconut milk is ¼ cup or 60 grams. Hi thanks for this great recipe. Do you think you can freeze the chicken in the marinade? We grilled this for dinner tonight and it was delicious! I marinated the chicken overnight and it came out so flavorful. I will definitely be making this again. Glad you enjoyed it, Ilene! Thanks for sharing! Hi there – I’m currently doing a low FODMAP diet for my IBS, and this was the first thing I decided to cook! The only question I have is that I’ve seen that coconut milk on the Monash app (at least with inulin) is considered a no no for the diet, do you have a specific kind of coconut milk you suggest? Hi Dalin, I use canned coconut milk which has a low FODMAP serving on the Monash app. It was mentioned in the narrative above the recipe, but I see I forgot to include that clarifying detail in the recipe itself. It’s now updated. Thanks! And, I hope you enjoy it. I had this last night and it was so hard to not go back for seconds. This is going into my regular rotation. Served it with basmati rice and sautéed Swiss chard/grape tomatoes. So. Good. Cooked this last night and served it with vegies. Easy to make and very tasty. Will definitely have again. Thank you Emily. Thanks for sharing, Jane! Glad you enjoyed it! !